We just got blasted by another winter storm, and won't be going anywhere for a while. So i started looking around for some projects to 'brighten up' the grayness of winter. These lovely tissue paper stars are just the thing! We hung them in our windows and when the light shines through them they just explode with color. As the colors overlap, it creates a second row of new colors. These are especially striking when you use primary and secondary colors and arrange them like a rainbow. 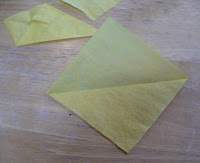 We just used what we had on hand, which were pastel tissue papers. 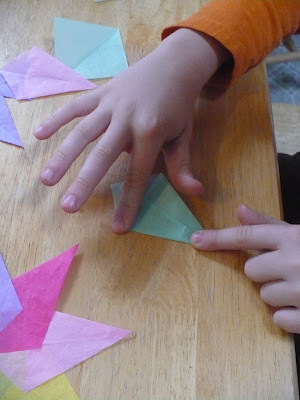 The kids were excited to make these, and they are easy enough that they were both able to participate. 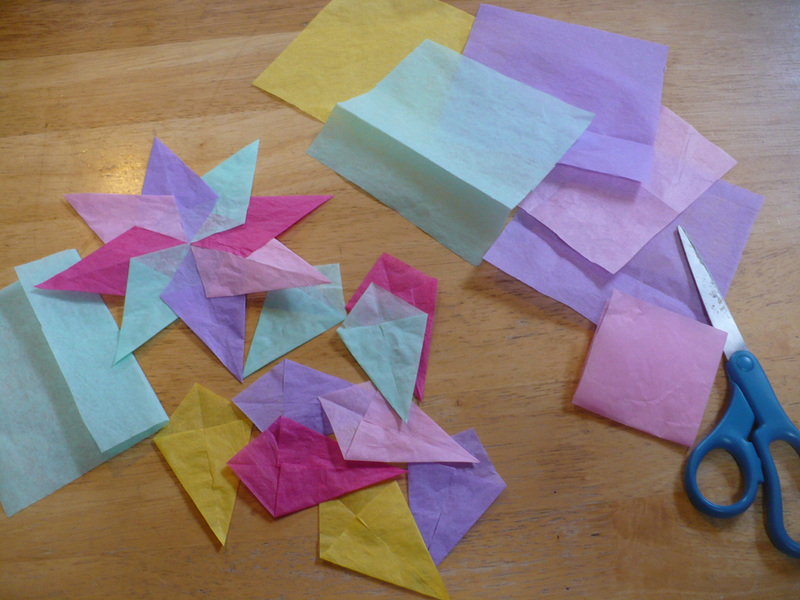 i started by cutting our tissue paper into 6x6 squares. 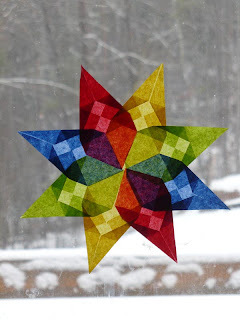 You can really use any size you want, 4x4, 8x8...to make different sized stars. Once i had several different colored 6x6 squares cut out, i folded each one in half horizontally, and then again vertically. 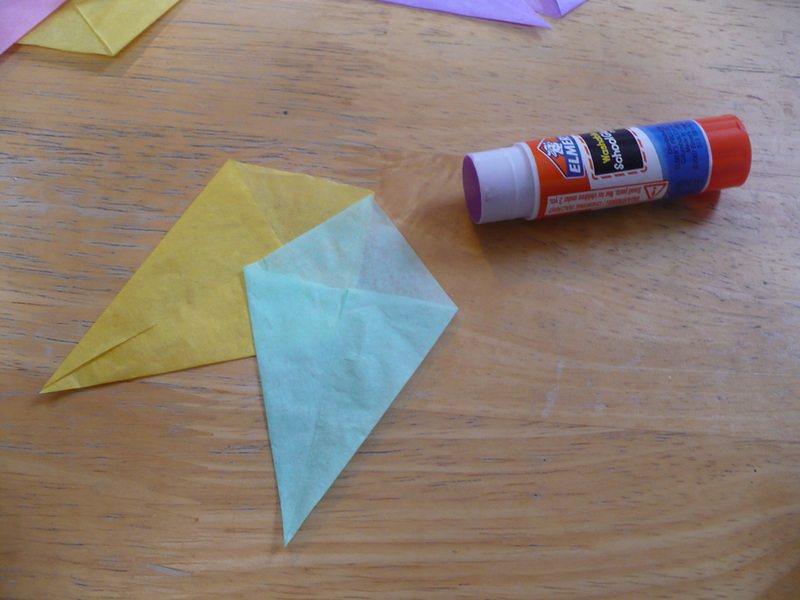 Now cut along the creases you just made so you now have 4 3x3 squares. Do this for each piece. It takes 8 3x3 pieces to make a star. We used 4 different colors in each star, you can use more colors or less colors. However you want to make them. 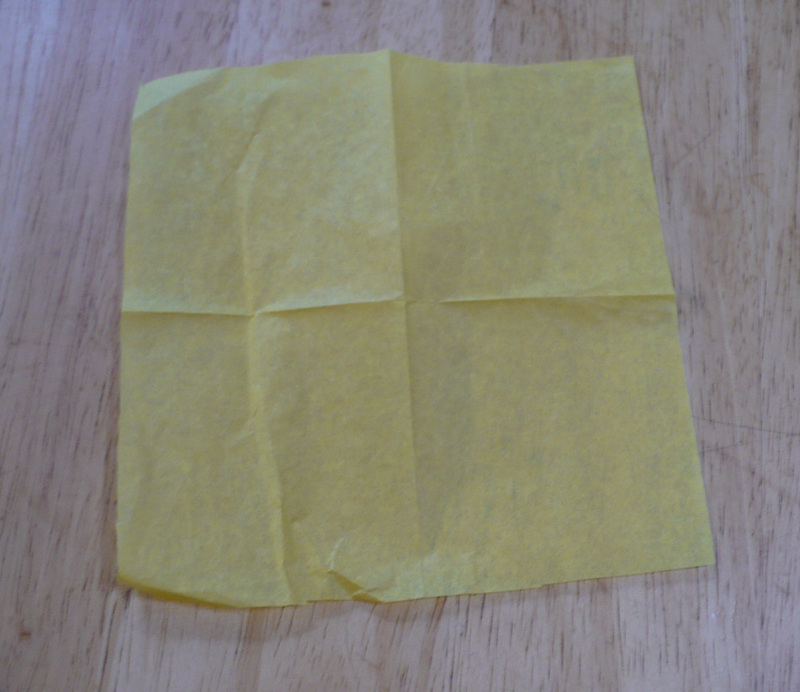 Now take your 3x3 square and fold it diagonally. 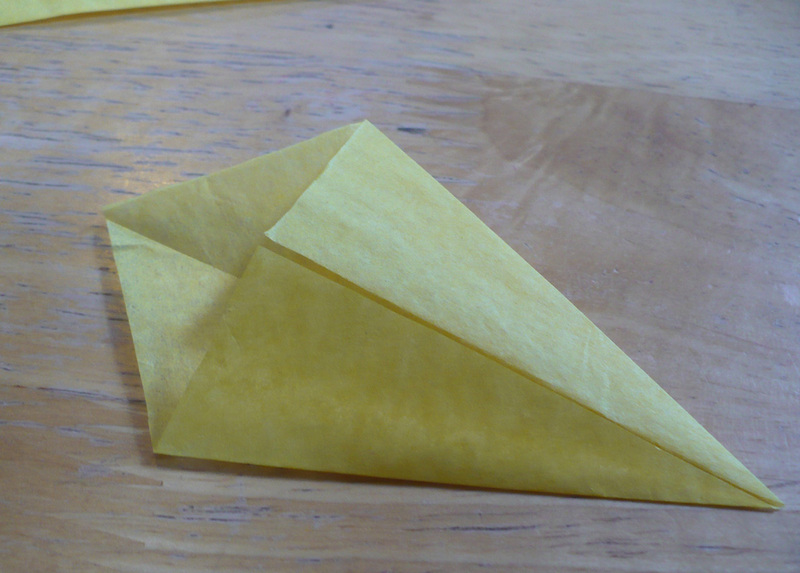 Now fold one side over so the edge lines up perfectly with the crease in the center. i used a glue stick, and put a dab of glue down to hold it in place. Do the same with the other side. It should look like this. Now repeat these steps with each of your 3x3 squares. My boy helped fold the points. It was a little tricky for him to start, but after a couple he was able to fold them himself. 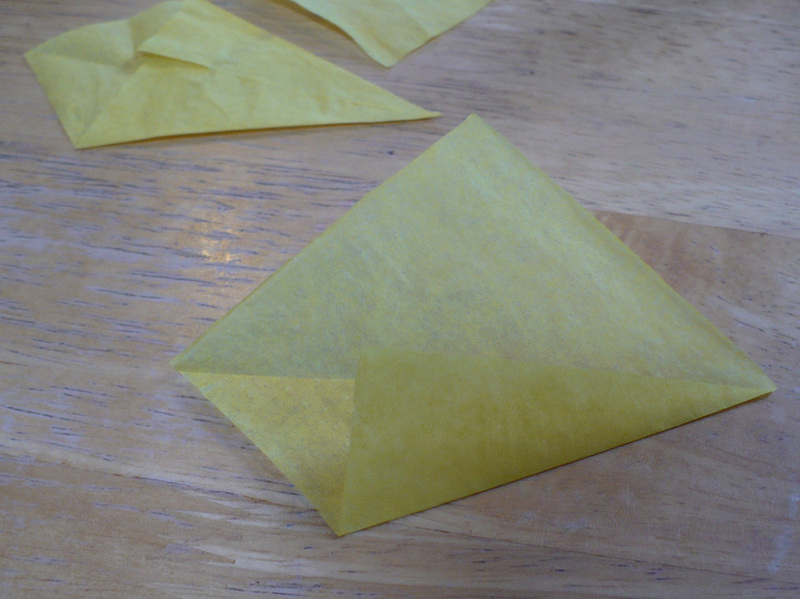 Once you have a good pile of them folded you can start putting your stars together. My 4 year was able to help with the putting them together. Using a glue stick, we applied a small amount of glue and then lined up the next piece so the points touch and the edge of the second piece lines up perfectly with the center fold of the first. Do this will all 8 star points. When you get back to the beginning, the very last point will tuck underneath the first. Add a little glue to hold it's place. i used a dab of glue from the glue stick to stick these in the windows. It's washable glue, so it will wash off easily. Most tutorials i have found for these call for Kite paper. Since we didn't have any on hand we just used regular tissue paper. The tissue paper worked fine, but is a little tricky to crease and i'm guessing the sun will fade them quickly. It was still a fun project to brighten up our dark winter days. i would love to try these again with rainbow colors. Thanks Tree!!!!! We'll be making these next week! These are lovely! I hadn't thought of making rainbow ones before. 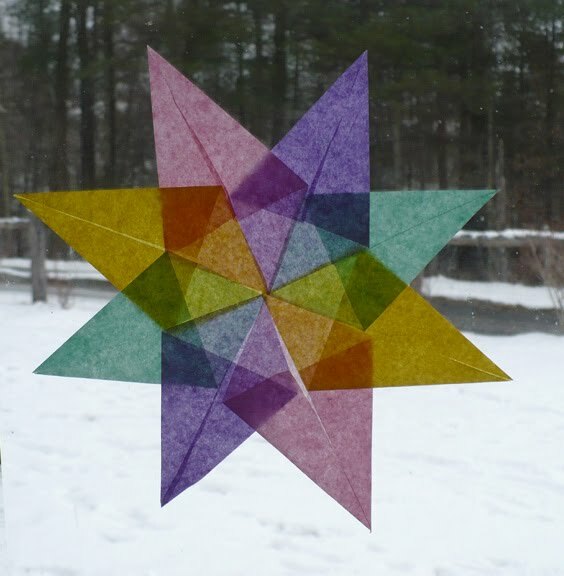 I am so going to get my window star paper out and get to work! Gotta go get us some tissue paper!!! Gorgeous! Sun catchers are always great! Thanks for the tutorial! 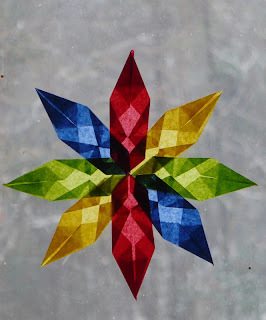 Ok, so I tried very thin construction paper I have and it was beautiful, no need to put it on a window of course since the paper is too thick for that. Now, here's what I am thinking. 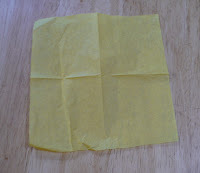 "Sticky notes" I believe are 3x3 and already have a sticky strip on them for the initial folds. Just need to glue them together.